You may already know that I am a PBS Ambassador. That simply means that PBS allows me to share exciting opportunities and information with all of you on a regular basis. This thrills me because I am a proud supporter of educational public television, and PBS KIDS is pretty much the only channel I allow my kids to watch without supervision. I grew up watching Sesame Street. In fact, my mami likes to laugh and say I watched it until I was 12 years old :/. And my favorite show ever was Reading Rainbow (I was crushed when they discontinued it), followed closely by Mister Rogers' Neighborhood and 321 Contact. And you all may have figured out by my incessant shares on Facebook and Twitter that my kids and I are AVID WordGirl stalkers fans - isn't everyone? - and both my son and daughter love Wild Kratts. Anyway, last week, I attended the PBS Annual Meeting in Denver. (You may have seen my picture on the MM Facebook page!) It was so much fun! I got to meet many of the characters my kids have fallen in love with, including the Cat in the Hat, Princess Presto, Hooper, and even Curious George. But I think the highlight of the trip may have been meeting Joanne Byrd Rogers, wife of the famous Fred Rogers. She was there for the exciting announcement that PBS is launching a new series based on her late husband's show. Many of the characters from Mr. Rogers' Neighborhood are back in this new, animated series. But now they are all grown up with preschool-aged children of their own. The main character is the most adorable tiger cub, Daniel (son of Daniel Tiger from Mr. Rogers' Neighborhood of Make-Believe), who enjoys wearing a comfy, red sweater and sneakers. Each episode is composed of two, 11-minute segments based on the same curriculum theme and weaves practical strategies into each lesson, teaching children how to deal with a changing world. It provides the children with the tools they need to manage their feelings. And it is done in an engaging manner. For every theme, a coping strategy is set to catchy music that can be easily remembered by parents and children alike. 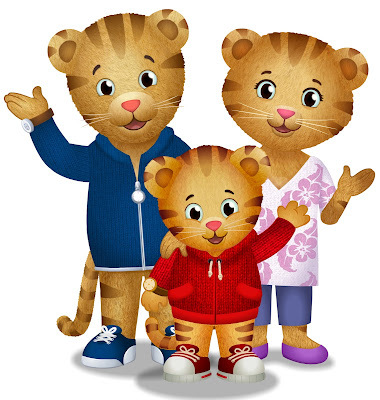 Daniel Tiger’s Neighborhood will premiere with a one-hour special right after Sesame Street on Monday, September 3rd. You can learn more on their new website. As a parent who grew up loving Fred Rogers' show, I was moved by all the familiar elements that have been incorporated in this new series. Trolley, King Friday's castle, O the Owl's tree, even the song that little Daniel sings, take me back to my own childhood. And I'm SO thankful that my own children can now experience a similar show and create their own special memories. Oh I am getting emotional just by watching the video clip! I was a fan a Mr. Roger's Neighborhood and miss him so much! I learned how to make my bed and tie my shoe with him! Oh the memories this clip brought just by the start and the trolley! I can't wait to watch with my kids! Hi, Maribel! They shared so many great video clips at the annual meeting. I was definitely all teary-eyed with so many memories of my own childhood. That's why I'm excited about this new series. I hope my children will enjoy it as much as I did Mr. Rogers' Neighborhood! I know you will love it, too. Oh it looks sooo good! And as a parent to a daughter who has a hard time regulating emotions and empathizing with others, hopeful this can help her! Thanks for sharing! I can't wait to watch it! I so wish this had been out when my kids were preschoolers. I think they would have benefited from it, too.